MyPlate food guidance symbol is used to teach nutrition in schools. As the MyPlate icon shows, the five food groups are Fruits, Vegetables, Grains, Protein Foods, and Dairy. The 2015-2020 Dietary Guidelines for Americans emphasizes the importance of an overall healthy eating pattern with all five groups as key building blocks, plus oils. (While oils are not a food group, they are emphasized as part of a healthy eating pattern because they are a major source of essential fatty acids and vitamin E). Each food group includes a variety of foods that are similar in nutritional makeup, and each group plays an important role in an overall healthy eating pattern. Some of the food groups are broken down further into subgroups to emphasize foods that are particularly good sources of certain vitamins and minerals. For example, the subgroups within the Grains Group encourage whole grains, which provide more fiber, magnesium, and zinc than refined grains. As nutrition science has progressed over time, scientists have discovered vitamins, minerals, and other components that make up our foods, and surely, there are more yet to be discovered. Food groups simplify dietary recommendations by focusing on foods instead of nutrients. For example, it’s much easier to try to eat two cups of fruit a day than 75 milligrams of vitamin C and 25 grams of fiber. The USDA Food Patterns provide the recommended amounts of each food group and subgroup at 12 different calorie levels, ranging from 1,000 to 3,200. These patterns are developed using food pattern modeling. By eating recommended amounts, individuals can meet their nutritional needs without having to track dozens of individual nutrients. 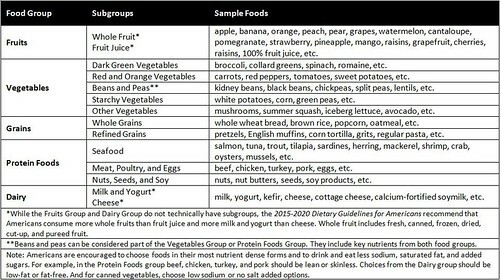 The USDA Food Patterns specify targets for each food group in cup equivalents (for Fruits, Vegetables, and Dairy) and ounce equivalents (for Grains and Protein Foods). Each pattern also includes a limited number of calories (8-19%) that can be used in other ways, such as small amounts of added sugars and saturated fats. Americans are encouraged to choose foods in their most nutrient dense forms as often as possible, to keep added sugars and saturated fat intakes each below 10 percent of total calorie intake. ChooseMyPlate.gov offers resources to help consumers determine what and how much to eat. The MyPlate Calculator is a simple tool for individuals to find personalized food group recommendations. Using the quick calculator is simple; enter a height, weight, gender, age, and physical activity level to get a personal MyPlate Plan with daily food group recommendations and a simple tracking sheet. 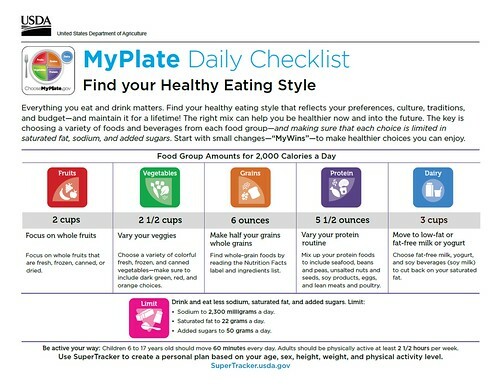 ChooseMyPlate.gov offers numerous food group-based nutrition education resources, including tip sheets, videos, food group quizzes, infographics, and more. 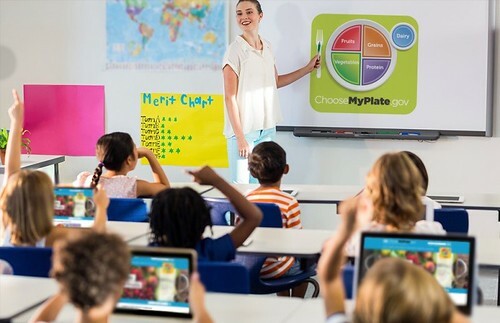 Plus, MyPlate offers audience-specific resources as well. For example, there are activity sheets, games, videos, and songs for children; activities for families; healthy eating on a budget resources; and MiPlato tipsheets and resources for Spanish speakers. To learn more about MyPlate and to find out when new resources are available, follow @MyPlate on Facebook or Twitter and sign up for MyPlate email updates at ChooseMyPlate.gov/govdelivery. Why do your food groups not correspond to the Nutrition Facts Labels on food packages which are Fats, Carbohydrates, and Proteins? There are 3 fat groups: saturated fat (from red meat, hard cheese, butter, sour cream, heavy cream, and lebne) , mono-unsaturated fat (from various nuts, peanuts, avocado, olive oil, canola oil), and polyunsaturated fat (from soybeans, walnuts) . There are 4 carbohydrate groups: grains and legumes (seeds), vegetables, fruits, and milk and yogurt. There are many foods that are mostly protein: red meat, poultry, eggs, pork, fish, shellfish, cottage cheese, Greek yogurt, and tofu. It is important for people to know that saturated fat is a secondary energy source and glucose rich foods (starch) are the primary energy sources. Excessive consumption of these foods lead to obesity. @Lois Redican - The Nutrition Facts panel and the MyPlate food groups are both tools people can use to build a healthy eating pattern. The Nutrition Facts label can be used when purchasing foods and when comparing two different food products. It provides information about macronutrients (fat, carbohydrates and protein) as well as select micronutrients, including calcium, vitamins A and C, and iron. The MyPlate food groups are designed to help people build healthy eating patterns over time. To build a healthy eating pattern, choices within each food group should be nutrient dense, meaning that they are low in added sugars, saturated fat and sodium. MyPlate is an icon that can help you to easily visualize the components of a healthy eating pattern. In practice, you can use the MyPlate food groups to help build and plan meals, and when you go to the store to shop for ingredients, look at the Nutrition Facts panel to make sure that you are choosing foods that are lower in saturated fat and sodium. it is interesting to me how eating more fruits and vegetables can make the different. Fruit cannot be more important than vegetables… Please check it. Dairy is not a food group! So many people are lactose intolerant and there are plenty of plant based calcium rich foods, like greens. Instead that food group should be just taken out completely. You could change it with fat if you want, but that should be a small percentage of our "plate".